I am actually really excited to share this mani with everyone.. I alluded to it a bit last week. I didn't know what to do with my nails and had sent a message to my sister asking what I should do - she quickly messaged me back saying 'DOMO!!!!' while I was sending a text about the base colour I was wearing. I said I would do them next week (aka now) and I actually stayed true to my word. 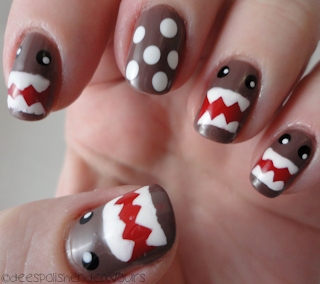 I know I have seen these gems done over on The Daily Nail and I saw a photo floating around on tumblr where the girl alternated between Domo and dots.. So I decided to do a bit of both. I like Domo and I like dots.. Ahh yes, an accent nail: done! I love these.. Yet when I scope the photo.. I'm like 'ew, the teeth! ew, this, ew, that!' but in reality I think they look fine irl.. AND I did get a wealth of compliments when I was at Sally's today.. So I figure my photo-critical mind is just a jerk. End of story. I used OPI Over The Taupe as a base, then I used Essie Lolipop for the mouth, Orly White Out for the teeth and eye glare, and Orly Liquid Vinyl for the base of the eyes. I also used my trusty brush* and a dotting tool from Born Pretty. *Ooh my trusty brush. Ugh. There was a stray fiber working against me last night, so I nabbed my scissors and made a little alteration.. And somehow that minor snip seemed to totally change the precision of my brush. I was getting pretty close to tears. Seriously. I knew that I wanted to make a mad dash over to Sally's the next day (aka today) because I'm on to my last bottle of Seche Vite and freaking out! Of course they only had one bottle of that magical stuff left. I did buy that Out The Door top coat while in Edmonton. Hate. It. I swear it took a solid hour to dry and ew, it left a strange finish to my nails. I get that people will like one thing and others will like another.. I stand by Seche Vite. I should know better not to get anything else. 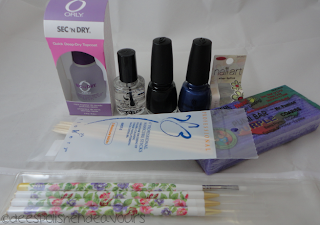 With that being said, I did also grab a bottle of Orly Sec n Dry top coat.. I will try it. I just know when I can stock pile my baby, I will be content! I also grabbed my fifth (maybe 6th?) bottle of China Glaze Liquid Leather my sister said the other bottle was running low. She prefers that.. I do still love it.. but Orly Liquid Vinyl is starting to steal my heart. I also got China Glaze First Mate - I think it is the right kind of blue I have in my vision.. You'll see! I also got some silver bullion beads AND I found a set of brushes that I might be content with.. My only wish is that they weren't floral printed.. But I can live with that. I also bought a pumice stone.. My hands from doing dishes are gross (in my opinion) - everyone else tells me my hands are extremely soft.. Maybe it is just me? Who knows! Oh, and some orange sticks. I was hoping they would have some other fun Orly polish.. Or some from the China Glaze electropop collection in store.. I guess I will just have to put my order in with Nail Polish Canada instead! Someone had asked me a month or two ago if I was still getting the luxe box monthly - answer: yes, I am! I just didn't know if anyone wanted to see.. But I had it sitting by my desk and figured I'd take a quick snap shot. I cannot wait for this week to be over. I have an exam and a final exam and then I will have some breathing room. My room looks like a battle zone.. Don't even get me started on my untried drawer - yikes! Anyways! The January luxe box was kind of rad - it had a secondary box called a bath and body box, which had the razor and shampoo/conditioner packets in it. Plus, they had a bottle of China Glaze nail polish - of course I'm insanely happy. It included: Yves Rocher Italian Mandarin Shower Gel (I will explain the scent once my sense of smell returns..), China Glaze polish in Sugar High (awesome because I love pink polish AND I don't own it already), DDF Advanced Firming Cream, and Kerastase Chroma Riche Treatment Mask.. Oh, there was also some Seattle's Best Coffee tossed in - I left that upstairs for the coffee drinkers. Phew! What a novel-esque post. If you made it all the way to the end, you're awesome! There was another story I was going to include in the post about talking with my dad about business cards and .com'ing this gem up, but I will share that some other time! I hope you're all having a great weekend! I am going to go do some more homework and try to get a wealth of sleep tonight. I have officially been sick for 2 weeks now; I'm exhausted! Take care!! Awww I love love love these!! The accent nail is perfect!